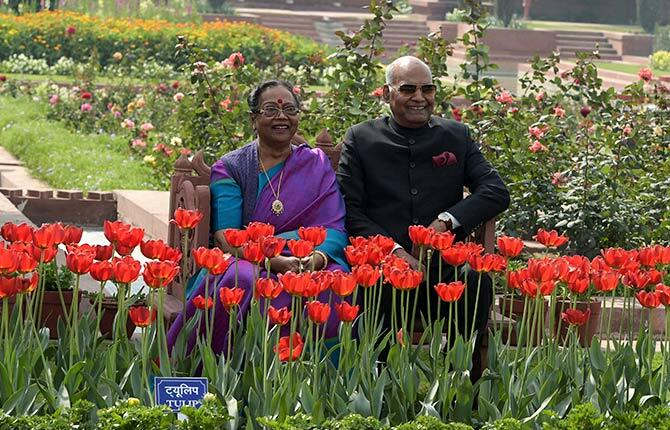 New Delhi (04/02/2019): On February 4, President of India, Ramnath Kovind inaugurated the annual Udyanotsav of the Mughal Gardens of Rashtrapati Bhavan. There are more than seventy varieties of of seasonal flowers including exotic bulbous and winter flowering plants in the gardens of Rashtrapati Bhawan. The gardens will be accessible to general public from Wednesday i.e February 6 and will be open for a period of 33 days till March 10 between 9:30 am to 4.00 pm in the evening, while the garden will be closed on Monday. On March 11, the Gardens will be opened for special categories, Farmers, differently abled persons, Paramilitary and Delhi Police. Eatables/Paan/Gutka/Cigarette/BackPack/Camera/Video Camera are not allowed inside the Gardens. Security and other guidelines which are displayed/announced at entry gate are applicable to all visitors irrespective of online booking or direct walk-in. According to the official website of Rashtrapati Bhavan, Mughal Gardens spread over a vast expanse of 15 acres, Mughal Gardens has often been portrayed, and deservedly so, as the soul of the Presidential Palace. The Mughal Gardens draw its inspiration from the Mughal Gardens of Jammu and Kashmir, the gardens around the Taj Mahal and even miniature paintings of India and Persia.